Sorry I have been AWOL. Blame the job. I will try to do better this year. Mother’s Day seems like a great time to renew this blog, since my mother has been such an inspiration to me. She’s 84 and she’s still gardening. It may be a micro version of the enormous garden she once had, but on the other hand she no longer has to feed six hungry mouths. She only has to enjoy the gifts that God gives us, with her expert care and vigilance against varmints. Mom: CRR is trying to grow some gooseberries from seed. I remember them from Grandma Benner’s garden, small seedy juicy berries that we ate straight from the plant. They’re called husk cherries in other parts of the country, which I discovered in St. Louis last summer when a James Beard nominee chef joyfully incorporated them into his dishes. Mom: I don’t “can” tomatoes like you did, but I diligently cook tomato sauce and freeze it, a frugal streak I got from you. Though I have to say, this time-consuming kitchen work is tried when I see that I can buy two 15-ounce cans of diced tomatoes for $1. Really, all that work for 50 cents?! I guess it’s the “love” component. Mom: My flower gardens are a direct tribute to your love of gardening. All year long, as I baby the flowers and admire their beauty, I think of you. The lilacs just finished. Roses are blooming. Soon we’ll have iris and peonies and hydrangea. Everything in its time. These things, so tangible yet so intangible, I owe to you. We owe to you. Sandy K. Johnson is a journalist in Washington, D.C., and mother of two sons. I was literally at the checkout of our local nursery, Greenstreet Gardens, when I spied the mandevillas. They are one of my annual go-to plants. CRR years ago gave me a pair of beautiful tall pillars, and they provide support for gorgeous mandevilla vines every summer. 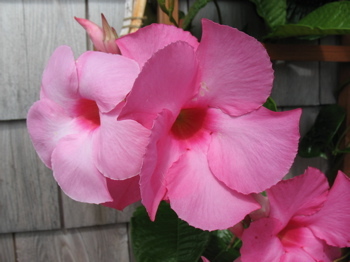 After trying several varietals, I’ve settled on the Alice DuPont, whose prolific pink trumpet-shaped blossoms are a show-stopper. They typically aren’t available here until mid-May – think Mother’s Day – because they’re tropical plants and don’t tolerate chilly spring nights. But the price was right, so I bought three. Back at the checkout, I asked the Greenstreet worker how much cold it could tolerate. “Cover it or bring it inside if the temperature goes lower than 45,” she said. It was a beautiful day – sunny, approaching 70 – so I was lulled into thinking our chilly nights were over. Well, three nights already this week I have had to cover the poor vines to shelter them from temps dipping into the low 40s. Tonight there is a threat of 30s, so I’ll just have to cross my fingers. And curse my inability to resist the temptation when I knew it was too early. Rookie gardener mistake!